By now, most of you are aware that Thomas Jefferson had a much younger brother, Randolph, and that he lived his entire adult life in Buckingham County at his plantation, Snowden. His 2,000 acre patrimony sat at the tip of the Horseshoe Bend, directly across from what is today Scottsville. Many of you have heard me speak about Randolph Jefferson and have read The Jefferson Brothers (Slate River Press, 2012). If you are hungry for more about the President’s brother, consider reading my profile in the 2011 issue of the Magazine of Albemarle County History. The article, “A Most Valuable Citizen,” expands on Randolph Jefferson’s personality and character, including a discussion of the paternity of Eston Hemings, Sally Hemings’ last child. At the time of Eston’s birth, there were two dozen Jeffersons who might have been Eston’s father, including Thomas, Randolph, and Randolph’s oldest sons. I am a semi-retired Biology Teacher and have attended some of the lecture series about the children of Sally and the author of America’s greatest document. I did not read or hear at anytime that the DNA data that was used in the Heming’s lineage of offspring was that of Thomas Jefferson, but of a close relative, and as Herb and Joann stated a Randolph Jefferson or very close relative. But, all that was necessary was the Y chromosome from Thomas or any of said possible male donors. Easton would be a female if he didn’t have the Y chromosome, and there were as pointed out several possible donors. I don’t know if such a source of TJ’s hair or perhaps a dental pulp could be obtained, the science of the genetics issue would be much more conclusive. Many assume that time doesn’t effect any DNA source, but unless you have perhaps a hair follicle or the pulp from a tooth, most tissue decays to a state that is not very helpful after over 200 years. The human genome has been mapped and there are so many questions about how many similiar genes that parents and children share that the further removed that gene is , the more unlikely the donor. I would be very interested in knowing where you got your (one) data about the conclusion that TJ was indeed the father of Easton?. Has some of TJ’s DNA been obtained? I have become very interested in researching now the mitochordrial DNA, but if there has been a TJ sample of DNA (not a sibling or relative) then the case could most certainly be more conclusive. the same that passes Monticello, that beautiful home of our topic author! James, to my knowledge, as of this date, none of TJ’s DNA has been tested, that is why all the male descendants of both Peter Jefferson and his brother, Field Jefferson, are candidates for paternity. I just wonder if one could be obtained? Forgive my spelling of Eston, for I do know better, and was in a hurry. Regardless, keep me informed, and I will pay close attention and will try to check out human genome studies at all research labs in the subject specialty. I have a good friend (retired librarian from Duke) who is quite versed in the field. The seeking of the data is the joy of research to me. I’ll bet the author of our Declaration of Independence would have accepted the virtual world and have had several web sites dealing with his various interests. He and James Madison would certainly have commented here and would probably have saved a lot of carriage time between Montpelier and Monticello. There are many samples of Thomas Jefferson’s hair (including those at the Library of Congress and Monticello/Thomas Jefferson Foundation) and tests have been (probably continue to be) discussed. If more happens on the Jefferson DNA front, it will make national news! 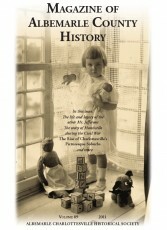 Thanks Joanne for a great and revealing book on the Jefferson brothers. Thank you also for following up on Randolph’s participation in the Jefferson-Hemings controversy. In gathering Jefferson material for our Jefferson Family of Virginia book we visited Randolph’s Snowden in reconstruction with large fireplaces at both ends. I don’t know the family that was having this work done but it looked just like the painting in the museum in Scottsville. As you may know, I assisted Dr Foster with the DNA study and after following his actions and that of Monticello and author, Annette Gordon-Reed, I knew something MUST be done to counter such outrageous uttering of untruths, therefore I was convinced that the Thomas Jefferson Heritage Society (www.tjheritage.org) MUST be formed to counter the many distortions and bias. My research led me to Prof Peter Onuf’s “Jeffersonian Legacies”, who sat in the Monticello sponsored history chair at UVA. The reason for this group’s writings was explained on Page 280, Prof.Rorty summarizes, “setting ASIDE questions of historical accuracy and philosophical justification in order to sustain present-day cause of international human rights.” I had found my “smoking gun” which explains Monticello’s participation in this issue. Why would THEY participate in a scheme to stab their man in the back that provides them employment, memorializing Mr Jefferson, etc. Don’t we look to them for accurate translation of Mr Jefferson’s life and homeplace? At this point and for the past 15 years that I have been associated with this project, I STRONGLY say, NO, they do not. They have followed this tactic with annual forums, their ten Getting Word Board members (African-Americans), including Julian Bond, Past Chairman, NAACP, and their Chairman, of the Monticello Jefferson-Hemings DNA Study, Dianne Swann-Wright, an African-American. They completely decimated their former title, Thomas Jefferson Memorial Foundation, to REMOVE “memorial” from their title. They sued our then Thomas Jefferson Foundation, took our name by court action and we were forced to choose another name, The Thomas Jefferson Heritage Society. This is all an act by a group that own Mr Jefferson’s estate, dedicated to slavery research! NOTHING proves that Thomas Jefferson fathered ANY slave child. Dr Foster ignored my pleas to inform Nature in the Nov 5, 1998 issue about Randolph Jefferson and sons, HE withheld this information from Nature, but after my complaint to Nature the Jan 7, 1999 issue carried Dr Foster’s admission of those mentioned above and he admitted that DNA did not prove that it was THOMAS, just some Jefferson. He later wrote a NYT article outlining this. Citizens you are being CONNED by high powered names such as Annette Gordon-Reed who brazenly stated in her last book, The Hemings of Monticello, that Thomas Jefferson fathered 7 of Sally’s children……………A LIE Neither she nor Monticello have this information. Your country’s history and that of a brave founding father are at great risk here……….WHAT will you do? This is a useful summary of the work of the Thomas Jefferson Heritage Society in regards to the Jefferson DNA study. Thanks, too, for your kind words concerning my work on Randolph Jefferson and his family. The house at Snowden post dates the Jeffersons and was built by John L. Harris c. 1850. We have yet to discover where Randolph Jefferson’s house sat. It is very probably that the Harris house is on top of the old foundations. Hi Joanne. I hope you are doing well. Reading your last posting made me think of something that you can answer in two minutes. Do I remember correctly that DNA has proved that one of Sally Hemmings kids were from Thomas and Sally, but only one. The others could have been from any one of a number of Jefferson’s? Or am I wrong about the one. Thanks Joanne. Went through your Buckingham yesterday! Only the line of Eston Hemings has been tested. He was Sally’s youngest child and the DNA suggests he had a Jefferson father. However, there were at least two dozen candidates alive at the time. Thus, there is no way to prove conclusively that Thomas Jefferson was his father. As far as I know, the lines of Sally Hemings’ other children have not been tested. I assisted Dr Foster and can answer your question. Joanne has done a good job on answering it. The DNA only showed SOME Jefferson and the Eston Hemings family had always believed their ancestor to be, “A Jefferson uncle (Randolph), as Thomas Jefferson’s children, grandchildren and the slave children , knew him to be and called him that. I have a copy of a letter stating that the Eston family knew him as “a Jefferson uncle or nephew” to be their ancestor. The Eston family NEVER claimed Thomas as their ancestor.